1. You can find cheap flights without having to rely on a travel agent. Thanks to online travel search engines, a few browser tabs are all you need to suss out the cheapest airfares and dates to fly. If you're backpacking around Europe or Southeast Asia, try SkyPicker - its cool map interface will show you an incredible array of budget flight routes. 2. 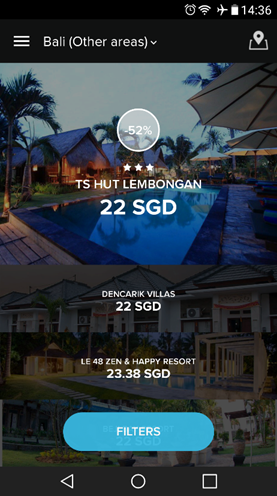 Last-minute hotel booking apps let you stay in posh places for less. With apps like HotelQuickly and Booking Now, you can go on spontaneous trips nearly anywhere and still find someplace to crash. I'm not talking dingy hostels here, I'm talking everything from cosy B&Bs to 5-star hotels at half off. Searching for hotels on Nusa Lembongan just before jumping on the boat! Where once we all had to carry maps or guidebooks around, now we can navigate using our smartphones. On Google Maps, for instance, you can pin down all the attractions you want to visit in a city and then save that map area on your phone for offline access. Apps like TripVerse even allow you to plot your itinerary on a map and save it offline together with contact information, opening hours, and your personal notes for each stop. 4. ...And then get there simply by booking a ride with a touch of your finger. Having never driven a bike before (and being a bit of a scaredy-cat), I decided not to rent a scooter to get around Bali even though there's no public transport on the island. 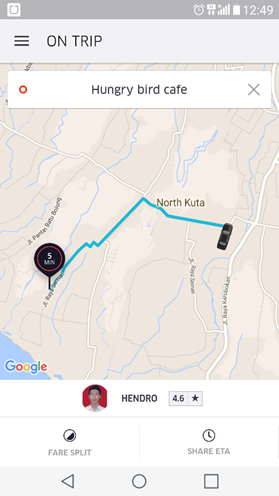 Fortunately, Uber and GrabTaxi just launched in Bali this year so instead of hunting down proper metered taxis, I could summon comfy cars with cheaper fares anytime. In Indonesia there's even Go-jek, an on-demand bike taxi app that you can also use as a courier or food delivery service! 5. You can find the best local grub, souvenirs, and even tour buddies without stepping out of your guestroom. Hunting down the best cafes? Hit TripAdvisor or Google. Need to bargain in the local language? Use Google Translate. Looking for someone to share some adventures with you? Log on to Meetup or Penroads. Needless to say, there's always good ol' Facebook for staying in touch with friends new and old. 6. Getting Internet connectivity is easier and infinitely more affordable today. I know you're going to scoff after reading all the above: "Most of these tools rely on an Internet connection, but how can I get reliable Internet access overseas without breaking the bank?" These days, local SIM cards are readily available at airports abroad so you can set yourself up with a prepaid data bundle. If you're travelling from Changi Airport, you'll be glad to know that it offers a more convenient and wallet-friendly solution! The ChangiWifi router, an overseas travel Wi-Fi router from Changi Recommends, provides unlimited Internet access for multiple devices - even tablets and laptops - when you're abroad. The ChangiWifi router can be used in 28 countries and shared by a group. The daily rate is much lower than data roaming; all you need to do is reserve your router online and you can collect it at Changi Airport before departure. Now that you've got all you need to travel independently, get set for more fun trips! 1 2 3 4 5 Please contact us for orders above 5 pieces.